The great thing about having friends with primitive dogs (especially when they are also well-versed in canine training and behavior!) is that you can commiserate about your experiences and struggles, and really celebrate your successes together. And in all reality, this is why we wanted to start our wonderful Couch Wolves Facebook Community! There are, however, some difficulties associated with owning mostly primitives or those with primitive dog tendencies… Sometimes dog greetings and meetings can become a little complicated! Much like the blog about Katie’s dogs Jari and Sonya, here is a story about a few of Katie and Molly’s dogs, and how they learned to coexist in Katie’s house fairly easily, as told by Katie. Right before Christmas, I had surgery on my right foot. This, of course, meant no driving for a while! Though I was unable to work my normal job as an ACO for a bit, I still took on some private remote clients, and had some come to my home to train. In addition, I was able to take on some nose work judging assignments and seminar talks. I also wanted to be able to go places every once and a while like a normal person! This meant that I needed someone to drive me, and Molly thankfully volunteered to do so on numerous occasions! I didn’t want her driving to be for nothing, so she brought over Mashi and Saga one night to get some training in, and she entered Journey in the seminars and trials I was doing. And since we aren’t exactly neighbors, some sleepovers were planned! Saga has been to my house many times, and she gets along brilliantly with all of my dogs. Mashi and Journey had seen most of my dogs, but not all of them, and not all at once in a new (to them) place! When Molly arrived, I let all of my dogs outside so that Saga and Mashi, and later Journey by himself on another day, could get acclimated a bit. For Mashi, I think having Saga around helped a bit, since as I let my dogs in, they were more interested in her at first. Journey’s overnight stay was after Mashi and Saga’s, so in a way, my dogs “knew” what to do! All of the dogs involved had a history of “look at that” work (so they look at the trigger, and are able to orient back to their handlers for a reward after a calm glance), so that made things much more helpful! Dogs remained on leash initially just in case we needed to get them away from a negative interaction. Molly and I were situated a good distance away from a baby gate barrier with a ton of treats (a metal gate that was too tall for any of them to jump without really having to think about it! ), so we basically continually either reinforced looking at each other, and recalls back to us for a while. After about 10 minutes of this when we noticed that all of the dogs were able to focus on us readily, Molly and I moved a bit closer in on the gate. We then worked on some obedience and tricks with the dogs so they can see that they can easily work near each other, then we would move them away from the gate to give them a break. 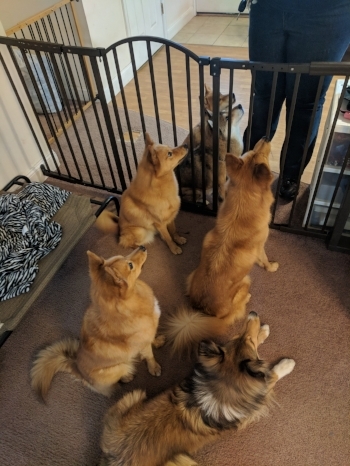 All dogs at attention! They know Molly has some good treats in her hands! Molly giving Saga and Mashi a reward while my dogs look on from close up. Once this was established and everyone was a little calmer from some training, we were able to take off some leashes and now reinforce laying down calmly. In addition, we worked on handing each other’s dogs treats over the gate, with our own dogs waiting for their turn. Soon enough, we had multiple dog reactive and dog selective dogs (and a couple of neutrals!) totally content to hang out. I went over to Molly’s side of the gate, which is where we spent most of our hanging out time, and would go over to my dogs to mark and reinforce calmness regularly. Everyone is more relaxed! Kimma has backed away from the gate, and Sonya is laying down. Jari was so excited to potentially get a treat from Molly that he is doing one of his favorite tricks in anticipation! In the case of Mashi and Saga, we opted to just have them separated totally. However since my girl Bubbles seemed to be taking quite an interest in Journey when he came over, we decided to try to have them both together in the same space. Since Bubbles was pretty dog neutral, we left her off leash and had Journey on. Molly and I were still armed with plenty of good treats, so I did some tricks with Bubbles while Journey played a little more “look at that.” We let Journey take the lead on greeting Bubbles, and called them away from one another after a few seconds at a time. This went very well, and after only about 5 minutes, both dogs were happy being near each other, Bubbles off leash and Journey dragging his leash. When all was said and done, however, we let them be for a few more minutes, then let Bubbles back in with the rest of my crew to give everyone a break. Journey and Bubbles posing for the camera! All in all things went very well! Everyone had their own separate spaces to sleep, and we had no real issues. Potty breaks were also separate to ensure that all dogs continued to have a comfortable time. It’s always interesting to get to practice what we preach, and in this case, it worked out great for us. We kept our expectations realistic, had backup plans in place, and implemented a lot of safety precautions. It is important to remember that your primitive dog might not always like every dog they meet, and you should choose how closely they intermingle with new dogs very carefully. Taking things slow is always a great idea, as if you are consistently reinforcing those positive interactions, you might be surprised with what can happen! And remember, in any case where you feel uncomfortable working with your dog or do not know how to help them to succeed, please find a qualified dog trainer, certified behavior consultant, and/or certified a veterinary behaviorist. Have you overcome any reactivity or dog selectiveness issues with your primitive dog recently? We would love to help you celebrate your successes in our Facebook Community!